Four more days until it's over. 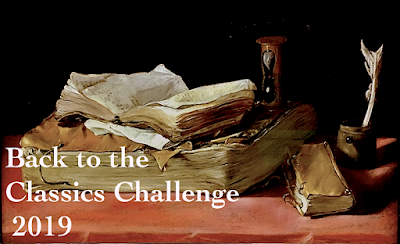 The TBR Dare comes to an end March 31. In an ideal world, the last 'dare' book would be completed around 10:30 PM Thursday night, leaving me ready to pounce on a stack of new books Friday morning. But this is the real world, and it will probably take longer to finish Wolf Hall. 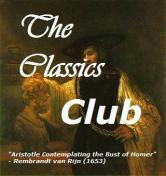 It is rich, complex, detailed, and interesting... but very slow. After nearly ten days, I find myself just past the half-way mark. I'm never dying to pick it up, yet it always manages to hold my attention. The coffee is poured and Wolf Hall is waiting. Enjoy your Sunday, and I'll be back later this evening to blog hop. You had to stay in a place to make it a home. A home had to be lived in every day, every month, every year for a long time, till it was worn like an old shoe and fitted the comfortable curvatures of your life. The Big Rock Candy Mountain is my current audiobook, but with so many passages like this one, I ended up borrowing the paperback from the library just to reread them. "O Noble Fool! A Worthy Fool!" I'm a hopeless realist, especially when it comes to fiction. That probably explains why I've come to love Richard Yates' writing. His characters are nothing if not real. "No Pain Whatsoever" opens with Myra smoothing her skirt and pushing Jack's hand away. She is in the back seat of a car, heading toward the hospital TB ward for a weekly visit with her husband. Jack is her boyfriend. 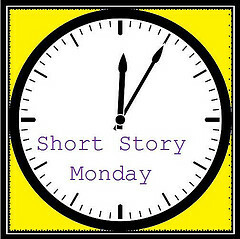 It wasn't that there was anything to be ashamed of - Irene and Marty knew all about Jack and everything; most of her friends did, and nobody blamed her (after all, wasn't it almost like being a widow?) - it was just that Jack ought to know better. Couldn't he at least have the decency to keep his hands to himself now, of all times? Tension builds as details slowly emerge. After deciding they will go out for drinks, Myra's friends drop her off at the hospital. All the sheets and the hospital pajamas were dyed yellow, to distinguish them from uncontaminated linen in the hospital laundry, and this combined with the pale green of the walls made a sickly color scheme that Myra could never get used to. At last we are introduced to her husband, Harry. He has been in the hospital for an undetermined length of time, with no discharge plans in the foreseeable future. When he bent forward to take the match the yellow pajamas gaped open and she saw his chest, unbelievably thin, partly caved-in on one side where the ribs were gone. She could just see the end of the ugly, newly healed scar from the last operation. "Not at all any more... I mean, as long as I don't go raising my arms too high or anything. When I do that it hurts, and sometimes I start to roll over on that side in my sleep, and that hurts too, but as long as I stay - you know - more or less in a normal position, why, there's no pain whatsoever." Myra has a brief breakdown after she leaves the ward, but recovers in time to join her friends for one final round of drinks. This story, like the Yates novels I've read, is very real and slightly sad. Simon (Stuck in a Book) said it perfectly in his post yesterday: "... next time I feel like a bit of American sombreness, I'll turn to Yates." It's interesting to note that Yates contracted TB and recovered after a brief convalescence. Using the resulting army disability pension, he moved to Europe in 1954, lived there for several years, and wrote stories. "No Pain Whatsoever" is from The Collected Stories of Richard Yates. I was not able to find it online. Good morning! After the gorgeous supermoon last night, it's sunny and cold in central New York. As the last few hours of winter tick away, signs of spring are finally beginning to appear. The snowbanks will be here for weeks to come, but I've heard birds singing, geese honking, and noted growing cracks in the ice on the lake. A new banner photo features this most welcome sight. The week passed quickly as the first few days found me home and slightly under the weather. 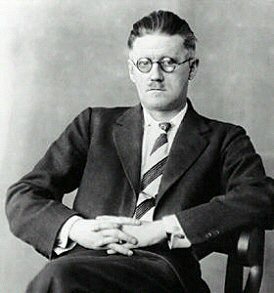 I read a couple of short stories and posted on "Eveline" by James Joyce for The Reading Life's Irish Short Story Week. The stories in Dubliners are unexpectedly accessible, but the feminist angle of "Eveline" provided an even greater surprise. I also began reading Wolf Hall by Hilary Mantel. 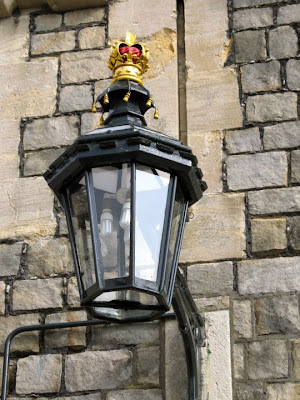 Tudor England is an ongoing interest and our recent trip to Hampton Court Palace gave me the extra push to get started but, after 200 pages, I'm finding it a very slow read. The story will pull me through, but it may take the rest of the month to finish. My current audiobook is The Big Rock Candy Mountain by Wallace Stegner. I've listened to about a third of the nearly 26 hour download. Stegner is a favorite (have I mentioned Crossing to Safety lately?) and Mark Bramhall is an outstanding reader. This is definitely a winning combination. I'm sure at least a couple members of my book club can be persuaded to purchase season tickets. Finally, March Madness is here. Excitement, upsets, controversy, human drama... I love college basketball. Our Syracuse Orangemen play this evening. 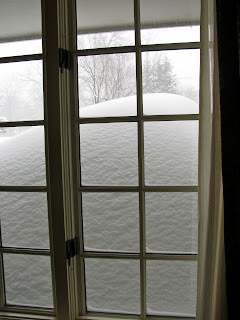 All reading and blog-hopping will happen this afternoon. 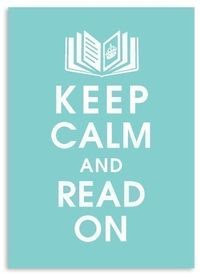 Will the Madness interfere with your reading? Winner of the 1973 Pulitzer Prize, The Optimist's Daughter is a quiet novel of self-discovery. After reading just one novel and a short story by Eudora Welty, I'm prepared to state with confidence that this author is all about her characters. Of course there is a plot, but it's the characters that will be remembered after the last page is turned. In The Optimist's Daughter, the optimist is Judge McKelva and his daughter is Laurel McKelva Hand. Laurel, a young widow living in Chicago, travels to New Orleans to be with her ailing father as he undergoes what is ultimately an unsuccessful surgery. Her mother is dead and the judge married Fay, a silly, self-centered woman younger than Laurel, shortly afterwards. Laurel and Fay return to Mississippi for Judge McKelva's funeral. Alone in her childhood home, Laurel arrives at an understanding of her parents, the past, and herself. That is the plot in its entirety. What makes the novel a delight, is the manner in which we gradually get to know the characters. Passages describing Judge McKelva's appearance allow a clear, detailed picture to form in the reader's mind. The judge's personality continues to emerge even after his death. "This is still his house. After all, they're still his guests. They're misrepresenting him - falsifying, that's what Mother would call it." Laurel might have been trying to testify now for her father's sake, as though he were in process of being put on trial here instead of being viewed in his casket. "He never would have stood for lies being told about him. Not at any time. Not ever." Fay is presented as a frivolous, self-centered woman and, although her words had me both laughing and rolling my eyes in exasperation, the picture remained constant. Laurel completes a journey of self-discovery as she learns more about her parents, their relationship, the past, and herself. The writing, at times, was simply beautiful and I can't begin to share all the flagged passages. Novels that slowly unfold to give a clearer picture of characters and their motivations can be counted on to captivate me. The Optimist's Daughter did exactly that. Bottom Line: The Optimist's Daughter was a perfect introduction to the novels of Eudora Welty. Especially recommended for those who enjoy 'quieter' books. ... even the lanterns wear crowns. Why don't I read more historical fiction? 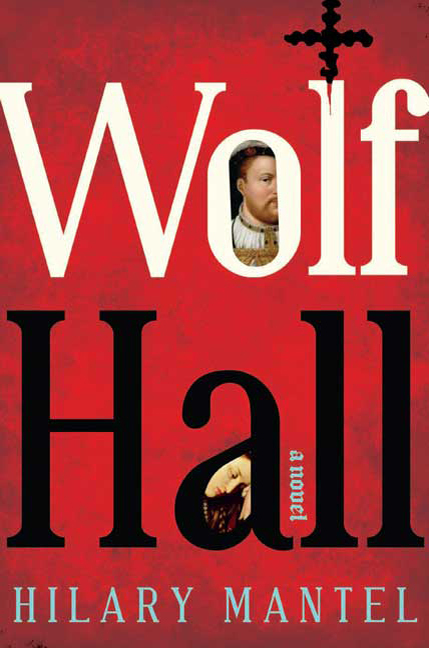 Wolf Hall is a fascinating novel about Tudor England, but definitely not a quick read. These 532 pages may keep me occupied for the rest of the month. "She sat at the window watching the evening invade the avenue. Her head was leaned against the window curtains and in her nostrils was the odour of dusty cretonne. She was tired." The opening lines of "Eveline" by James Joyce create an immediate sense of loneliness or isolation in this very interior story. The bookmark in my copy of Dubliners hasn't moved in months, but Irish Short Story Week hosted by Mel U at The Reading Life provided the motivation to finally return to this classic. "Everything changes. Now she was going to go away like the others, to leave her home." She pauses to reflect on home, question the decision to leave, and examine her hope to be respect as a married lady in a new country. Eveline does not want to be treated as her mother had been. With no one to protect her, she is afraid of her father's violence, yet she has two younger sibling to care for. And then there is the promise made to her mother. But what about Frank and the possibility of a new life as his wife? Eveline's plight was not uncommon; few choices were available for women in early 20th century Ireland. Leaving offered the only opportunity for a better life, yet ties to family, home, and the past often proved too strong to be broken. Eveline is left paralyzed... as trapped as a 'helpless animal'. Dubliners was first published in 1914, and "Eveline" may be read online. We're back, unpacked, and finally caught up after a week in London. Now it's time to ease back into blogging. The trip was all we'd hoped for. 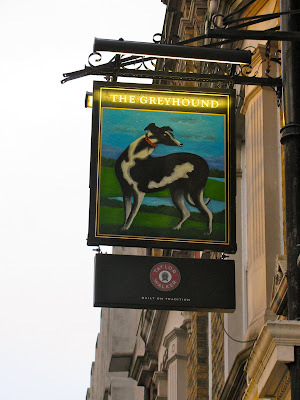 It was the perfect 25th anniversary celebration, with plenty of time to reconnect with our daughter studying abroad and see 'her' London. There were opportunities to meet with friends, old and new, see a show, and visit historic sites and museums. Sure, there was a little rain and the natives kept apologizing for the cold weather, but it was wonderful to see daffodils, crocus, forsythia and flowering trees! "Are you in there, Verity?" Naturally, I made the pilgrimage to Persephone Books. The shop was just as cozy and charming as expected, and I came out with a dovegrey tote filled with six books and matching bookmarks. We also visited Waterstones, where a few more treasures were collected. At this point, with mounting concern over luggage weight limits, my book browsing was curtailed. There was nearly one final purchase at Heathrow Airport.... I needed a copy of South Riding, but my husband, already toting a carry-on loaded with 10 books, put his foot down. So, did I read on the trip? I listened to The Color Purple on the flight over (outstanding audio read by the author), got through a stack of New Yorker magazines, then finished Notes on a Scandal by Zoe Heller as our return flight landed. 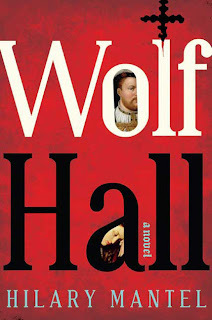 Ten exciting new books to choose from, but the last month of the TBR Dare and a post- Hampton Court "Tudor mood" lead me to start Wolf Hall by Hilary Mantel. As many bloggers have noted, unclear usage of the pronoun 'he' is annoying, but I'm quickly becoming engrossed in the story. 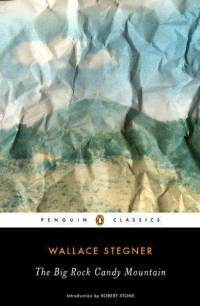 On audio, The Big Rock Candy Mountain by Wallace Stegner has captured my imagination. Stegner's Crossing to Safety is an all-time favorite, and this 20 CD semi-autobiographical family saga has me totally hooked. 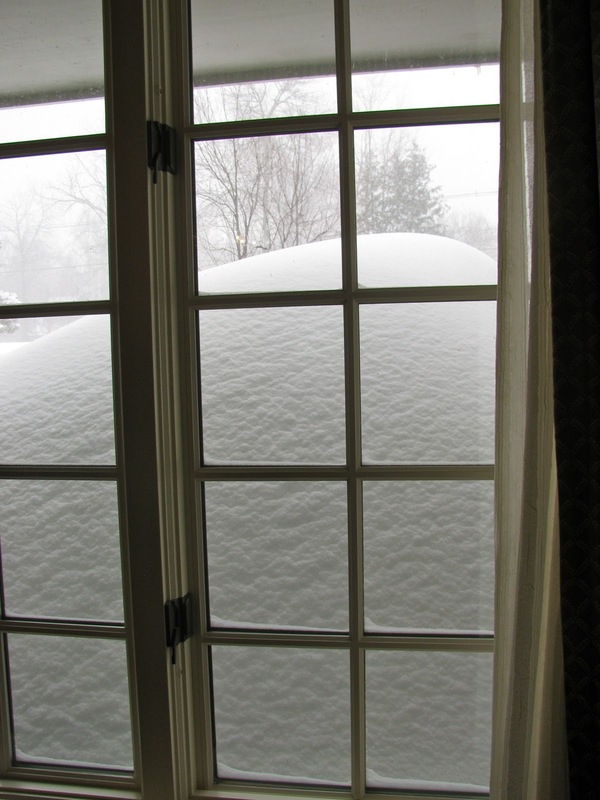 ... after yet another winter storm. Look closely for the fence on the right. A deer in search of food steps up from the frozen lake. She spots me in the window. An old cedar becomes a snack for two.